Kidsskin Spf50+ Suncream – a major new advance in sunscreen technology from Extreme New Zealand. 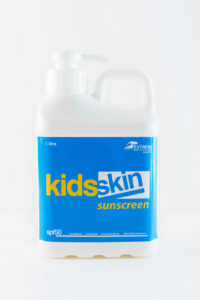 Kidsskin is Ultra Protection in a new SPF 50+ formulation demanded by the highest sun protection standards in the World. Kidsskin is an organic formulation, made to exceptional standards. Demanding new sunscreen standards by the authorities in New Zealand and Australia, especially in the UVA range of the spectrum, has produced what is probably the finest protection for children, ever. New Zealand and Australia requires children to carry sunscreen always. It must be accessible, useable and both kid proof and action proof. It’s why Kidsskin is the standard (compulsory) choice of over 250 pre-schools in New Zealand and is the most popular sunscreen cream there amongst children of all ages. For kids this sunscreen cream had to be highly sweat resistant, and naturally very highly water resistant. (We cannot claim waterproof – neither can watch makers.) It had to be broad spectrum, with both UVA and UVB protection (highly protective Kidsskin has an extremely high sun protection factor (SPF) of over 65), and it had to exceed all current world standards including the severe American FDA. It had to be kid friendly – no stinging eyes, no white patches, no visible signs – it had to smell good, rub in easily, and be safe to use. Kidsskin is all of these. After independent laboratory testing in Australia, Kidsskin can claim to have Very High UVA protection, Very High UVB protection, and very high water resistance. Kidsskin is paraben free, non-allergenic, PABA free, gluten free, nano-particle free, non-sticky, non-greasy instantly absorbed and made from the latest and safest organic materials in the world. It contains no micro or nano-particles, is safe for all skin types and completely non-reactive. Kidsskin contains pro-active Manuka Honey UMF 18+, renowned for its antiseptic and healing properties, and Aloe Vera; both known anti-inflammatories and effective moisturisers. It’s great for their skin, and your total peace of mind. Extreme sunshine and UVA/UVB penetrating rays, and the high rates of skin cancer in the Southern Hemisphere requires sun creams that meet the demanding protection needed. 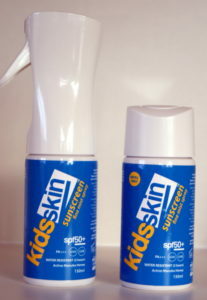 From the company that produced the best-selling Surfersskin (now used on all UK beaches by the RNLI), and the world-renowned #1 selling Golfersskin, Kidsskin was the result of years of research into a sunscreen that kids could safely use, that would meet their personal standards while at the same time offering secure and trustworthy protection. Kidsskin exceeds the world’s highest Sunscreen standard – the AS/NZS 2604:2012. (Available on request). Kidsskin has the approval of the International Melanoma Foundation. Kidsskin tested in vito (on person) at an spf of 66. This is as high as sunscreen carefully gets, and is legally allowed in Australia and New Zealand. Claims of spf 100 are spurious at best, fraudulent at worse. We do not use animals for testing. Apart from world-class broad spectrum sun protection with a safe, spf50+ waterproof, sweat proof formulation, The Unique Ingredient Combination within our formula provides many skin care benefits to water users in addition to serious sun protection. Offer strong anti-oxidant support to help fight free radical damage. Vitamin E: Vitamin E is one of the primary anti-oxidants used in Surfersskin. This combined with UVA/UVB Broad Spectrum sunscreen in Surfersskin assists in preserving the skin’s barrier function which helps to maintain over all skin health. Vitamin A: Vitamin A is a great anti-aging nutrient. When combined with UVA/UVB Broad Spectrum in Surfersskin sunscreen your skin re builds and rejuvenates – keeping lines, wrinkles, dull skin and other anti-aging symptoms at bay. Aloe Vera: Aloe Vera is renowned for its many medicinal benefits. Combined with UVA/UVB Broad Spectrum sunscreen in Surfersskin it helps to increase the strength and synthesis of the skin tissue making it a vital ingredient in Surfersskin sunscreen. Safe and suitable for all sensitive skins – in the three years on sale we have not had a single reported allergic reaction to this sun cream. Kidsskin. Probably the safest and best sunscreen you can buy for your children. Follow the use instructions for happy, sunny kids. Available in a 125 ml safety squeeze tube, a 375 ml family pump pack and now in a 150 ml unique alcohol-free and propellant-free pump spray!